A bright sunny day with highs in the 70s in January sometimes ends with a bang. As in thunder. 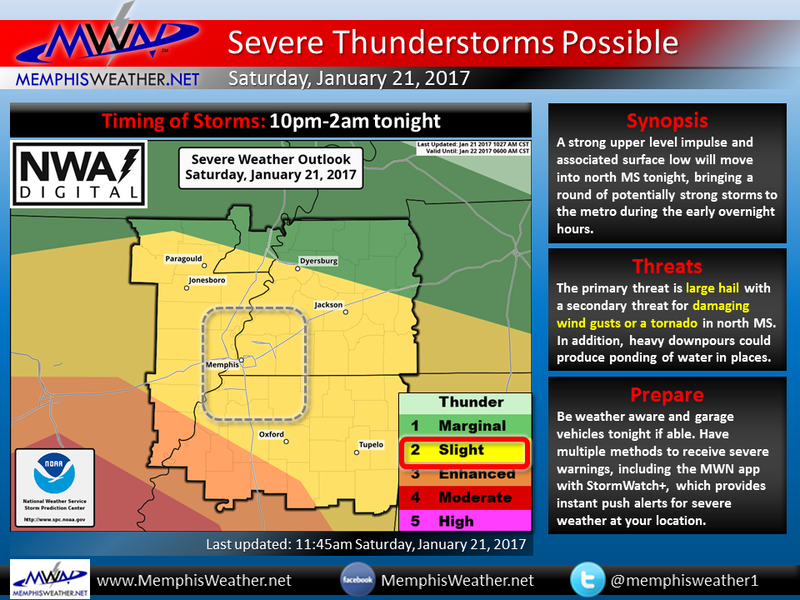 That appears to be the case tonight as storms, some potentially strong to severe, move through the Mid-South. Enjoy the awesome weather today, then be prepared for the likelihood of thunder and lightning as you retire for the night, or enjoy an evening on the town for some. 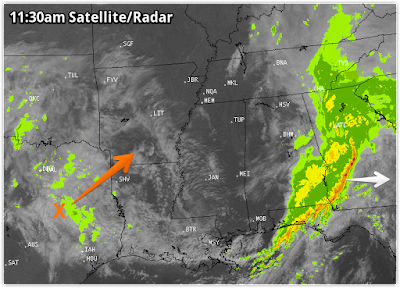 As one line of storms moves into the southeast coastal areas, another system starts organizing to our southwest. It will move our direction tonight. In the meantime, sunny skies prevail. A severe line of storms moved by to our south early this morning and is now trucking through southern GA and northern FL. Unfortunately, deaths were confirmed in Hattiesburg as a tornado likely touched down in the wee hours this morning. As that line moves away, sinking air behind the system is resulting in sunny skies behind it. However, looking southwest, another storm system is brewing as low pressure starts moving east into the southern plains, preceded by upper level impulses that spin off the parent low. One such upper level wave will force scattered thunderstorms to form late this afternoon over the ArkLaTex area and move east-northeast. These storms will quickly become severe with large hail likely and a few tornadoes possible. After the storms exit, we expect a lull in the activity until around sunrise or so Sunday morning, when more scattered showers and some thunderstorms arrive and continue off and on into the early afternoon hours as highs climb to near 60. This activity will be in response to the surface low pressure system currently in NM moving just north of Memphis. 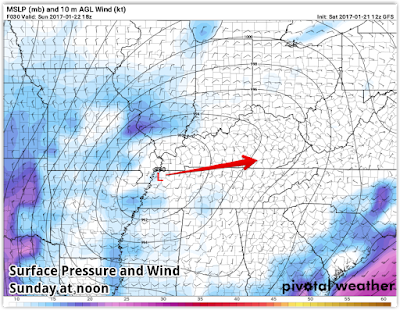 Due to the very cold air aloft associated with the low itself, a few storms tomorrow could produce small hail. 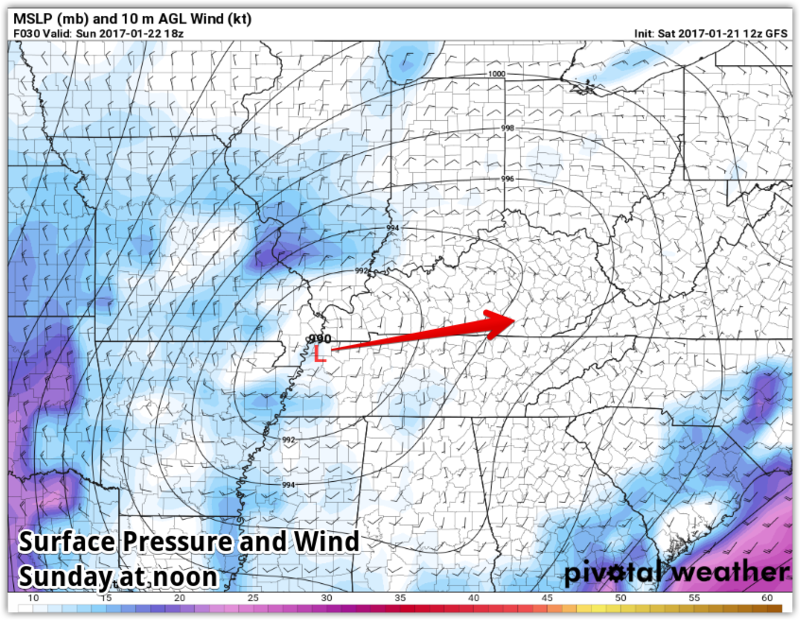 By late afternoon, the low passes, wind shifts to the northwest and becomes gusty. Showers end during the evening as temperatures fall to near 40 by Monday morning with wind chills in the mid 30s. A cooler day is on tap Monday with highs only in the lower 50s as clouds move out. A couple "warmer" days near 60 are expected Tuesday and Wednesday before a significant pattern shift takes place that results in more winter-like temperatures, but dry weather, to end the week. Highs will be in the 40s and lows in the 20s to near 30. With severe weather possible tonight after dark and probably after bedtime for most, we highly recommend having a way of receiving severe weather information. 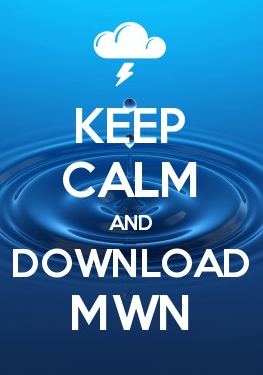 We encourage you to check out our MWN mobile app and add the StormWatch+ upgrade within the app. You can set the warnings you want to receive and only receive them for the specific location(s) you select. Tornado and Severe Thunderstorm Warnings are alerted with "wake-me-up" style audio, while the rest use your default notification sound. Check the app out in your app store or click the link below. We'll also be nowcasting the storms as they move through tonight on our social media feeds, which can be found below as well. 20s to 70s - it's winter in Memphis!